Owen Wilson’s character was positively revolting. A total jerk, completely dense, and extremely narcissistic (or at least, my impression of what a narcissist would like like). The fact that Reese Witherspoon’s character kept running back to Wilson infuriated me. I can’t stand stupid girls!! Women, it is time that we stop settling for any guy that comes along. Seriously, we deserve much more than that! Reese Witherspoon is a brilliant actress – although the role was a different one for her, she was splendid. And her blue eyes are stunning. Paul Rudd’s character was the cutest guy ever…awkward, terribly unlucky, and yet a true gentleman. I have decided that I am going to absolutely LOVE my LAPP professor (though NOT in one of those weird “professor crush” ways – merely as a person). He did not assign any homework for the first day of class, and he sent us a nice email on Friday informing us that we merely needed to buy the book and show up for class. Just based on the wording, I could tell that I was going to like him – and I was right!!! He started class by telling us about himself, where he grew up, why he went to law school, etc. He probably spent a good 30 minutes of class on just introductory material. My FAVORITE part of class, however, was his “LAPP Exercise Chart.” It is a new challenge that he is instituting this quarter. After telling us that exercise helps you think better (and yes, it does!! ), he proceeded to outline the challenge. There are 8 weeks on the chart. We have to exercise at least five days a week, and there are certain minimum time/mileage requirements, depending on what you do. For my purposes, running requires 15 miles. Considering that my run on Saturday will be 12 miles, meeting his minimum will be a piece of cake. In fact, all I have to do is add one more day a week of something…probably 30 minutes of pilates with Denise Austin. 🙂 And what, you may ask, is the incentive for finishing this 8-week challenge? A LAPP Exercise Nerd t-shirt (oh, and a “refreshed mind and healthy body!). So far, I have completed 5.35 miles of my running requirement for the week – and that was only yesterday’s workout. 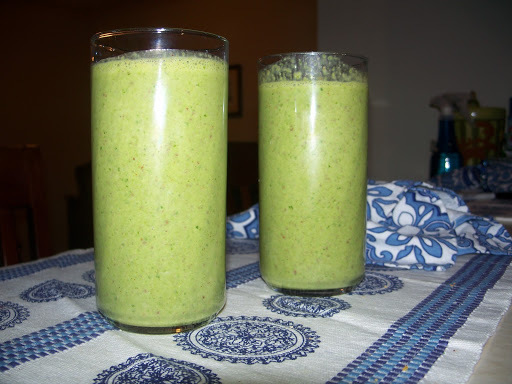 And now, finally, what you all have been waiting for – The GREEN MONSTER!!! I know that many of you are thoroughly grossed out by the fact that I am encouraging you to throw spinach into your blender. Trust me, I have gotten some teasing from my roommate, and a long pause on the phone from another friend. 🙂 However, I promise – you cannot taste the spinach! If you don’t trust me, try it first by adding spinach to your regular fruit smoothie. 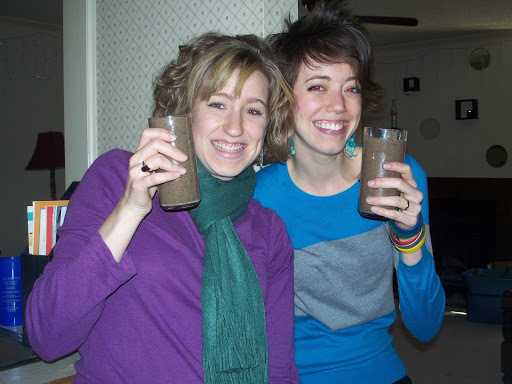 About to enjoy our grown-up “dirt cups”! !